It looks like Sony has already geared up to kick off 2016 with a bang! We received an invitation for its upcoming CES 2016 press conference, which is to be held January 5 at 5PM Pacific time — in the Las Vegas Convention Center, as usual. The invitation's visuals include VR headsets, hi-fi gear, a CyberShot camera, a disturbingly thin TV, and perhaps most interesting — a smartphone! Naturally, this has sparked visions and aspirations about an upcoming Sony Xperia Z6 flagship smartphone inside the tech media circles. But common sense dictates that, outside of Sony's R&D labs, the Xperia Z6 right now is nothing more than 'clickbait' material. After all, the Xperia Z5 trio, which was announced this September and released shortly after, is still very fresh on the market. Introducing an iterative, specs-focused update as early as January would do little more than kill Z5 sales and frustrate owners of the smartphone. Then again, this is merely an outside perspective — Sony execs probably see things differently. 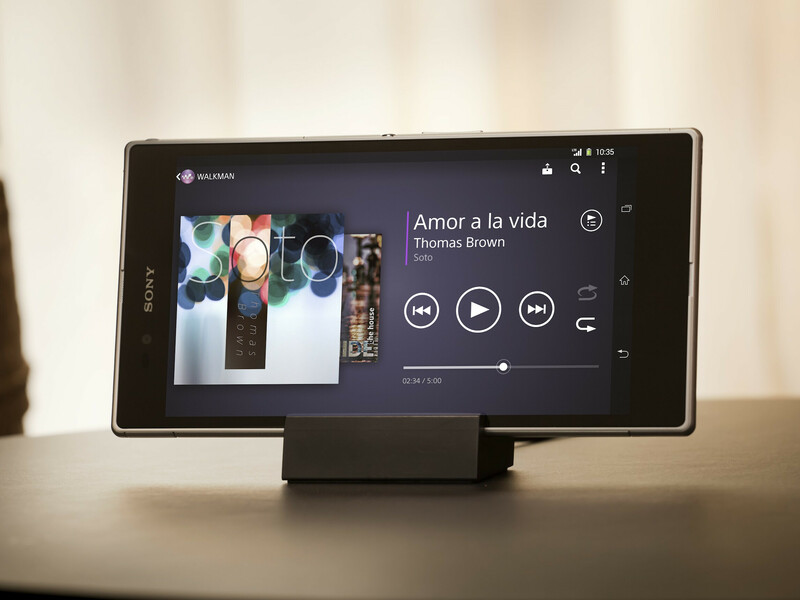 The original Xperia Z Ultra - Sony at large! However, the smartphone rat race has been rather intense lately, with Samsung reportedly preparing its Galaxy S7 products for a February 21st announcement at the Samsung Unpacked 2016 event. Android competitors are usually looking to retaliate with hi-end offerings near the same time frame, which means Sony could take the opportunity for making an exciting smartphone announcement on the back of Qualcomm's Snapdragon 820 SoC, which is already quite the hype engine! Rather, we're thinking more in the lines of a Xperia Z5 Ultra, which is already rumored to ship March next year, sporting cutting-edge features such as the aforementioned chipset, 4GB of LPDDR4 RAM, a 6.44-inch, 2160 x 3840 (4K) resolution display, a 23MP primary camera, and a large battery to keep all those power-hungry components on-line. At launch, the Z5 Ultra could turn out to be one of the most powerful phablets so far, despite competition from the likes of Samsung, HTC, and Xiaomi — all geared up to launch hero phones during the first quarter of 2016. With such an intense all-around device in the pipeline, we expect Sony to at least tease the Z5 Ultra (or whatever it has in store) at its CES press conference, leaving the Xperia Z6 flagship for the second half of 2016. Then again, this is all rumor mongering at this point, so better keep that doctor-prescribed grain of salt nearby! 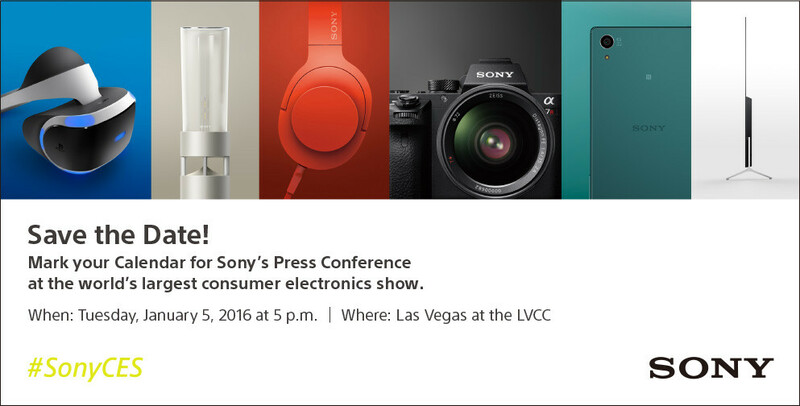 Sony's CES 2016 press invite. Sony may out z5+ with sd810! just to continue their 3 months flagship cycle. Z5 Ultra is more likely, but no means Sony can go do the Z6 route. I only think Sony will make only the Z6 this year, and the Z7 some other time... Also Sony gonna make a new version of that DAC player, and some other great tech goodies. Yeah i dont care what they announce as long as its premium and dont have a 810 in it and comes to verizon! A Z5 Ultra with those specs sounds luscious. Really wish Sony would adapt even more of a near stock Android experience. Whatever happened to that beta test of a new Ui which pretty much looked like stock Android with Sony apps? Things were looking good! I'm beta testing that right now! Nice! Which region? How does it look like in reality? Zylam!! Sony's UI is one of the closest to stock Android!! Nope... Will be accessories and one mid end device. Almost every article on PA contains Could or May! Come with some real news, not every time this companay could or may announce! There's nothing bad in that. Z5 premium is so expensive what more a Z5 ultra! Sony should review their pricing . Their mobile phone business will not be able to recover if they continue to sell their phones at those outrageous price. 6.44 inch will be nice with sd 820 32gb and support of micro sd up 128gb 4000mah battery with z5 camera will be great .this is the phone I'm waiting for. If can do like samsung doing VR headset even better. The only reason sony is releasing flagships so fast is to catch up with the number series of other flagships, As samsung is releasing the S7 and apple the iphone 7, sony is still at 5, so i think they want to be on leverl with the numbers here. they should have been releasing the xperia Z7 now with the other big companies. All metal ultra with small bezels, on bezel buttons, and a pair of hi end earphones in the box. Probably just a Z5+ which could be the Z5 Premium but with a qhd display, sd820, 4gb of ram and a overhauled fingerprint scanner.